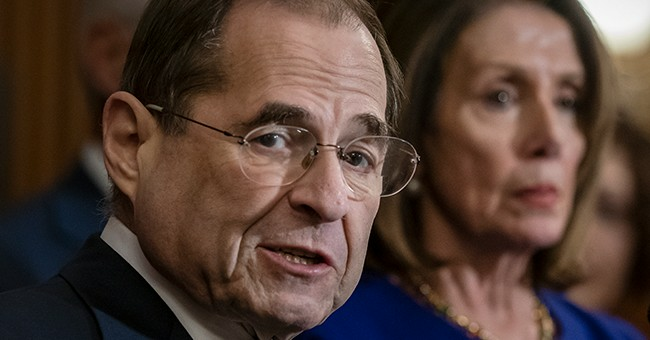 House Judiciary Committee Chairman Jerry Nadler (D-NY) on Sunday reiterated one important fact: Democrats in the House of Representatives are prepared to subpoena Special Counsel Robert Mueller and Attorney General William Barr in order to obtain a full copy of the Mueller report. Nadler and his colleagues from five other committees sent a letter on Friday saying they expected "full transparency." But Nadler took the sentiment a step further, saying he's prepared to go to the Supreme Court of the United States, if he must, in order for the Muller report to be made public. "We'll try to negotiate. We'll try everything else first, but if we have to, yes, we will certainly issue subpoenas to get that information,” Nadler told CNN's Dana Bash. "And you're going to be willing to take that all the way to the Supreme Court if you have to?" Bash asked. "Absolutely," Nadler replied without hesitation. According to the House Judiciary Committee Chairman, President Trump cannot use executive privilege as a way of circumventing a potential subpoena. Nadler specifically references United States v. Nixon, where the Supreme Court unanimously agreed President Richard Nixon had to turn over take recordings and other materials associated with the Watergate scandal. "Executive privilege cannot be used to shield wrongdoing," he said. Nadler also explained why it's important for the American people to see the full report. “We're likely to see what Barr characterizes as the main conclusions of the Mueller report. And we'll accept them, but subject to seeing all the underlying data,” Nadler said. “We have to make judgments. The American people have to make judgments as to how founded those conclusions are or Barr's summary of the conclusions are. And that's one reason we have to see the entire report and the evidence underlying it."